A team of French astronomers has captured one of the sharpest colour images ever made. They observed the star T Leporis, which appears, on the sky, as small as a two-storey house on the Moon . The image was taken with ESO's Very Large Telescope Interferometer (VLTI), emulating a virtual telescope about 100 metres across and reveals a spherical molecular shell around an aged star. “This is one of the first images made using near-infrared interferometry,” says lead author Jean-Baptiste Le Bouquin. Interferometry is a technique that combines the light from several telescopes, resulting in a vision as sharp as that of a giant telescope with a diameter equal to the largest separation between the telescopes used. Achieving this requires the VLTI system components to be positioned to an accuracy of a fraction of a micrometre over about 100 metres and maintained so throughout the observations — a formidable technical challenge. When doing interferometry, astronomers must often content themselves with fringes, the characteristic pattern of dark and bright lines produced when two beams of light combine, from which they can model the physical properties of the object studied. But, if an object is observed on several runs with different combinations and configurations of telescopes, it is possible to put these results together to reconstruct an image of the object. 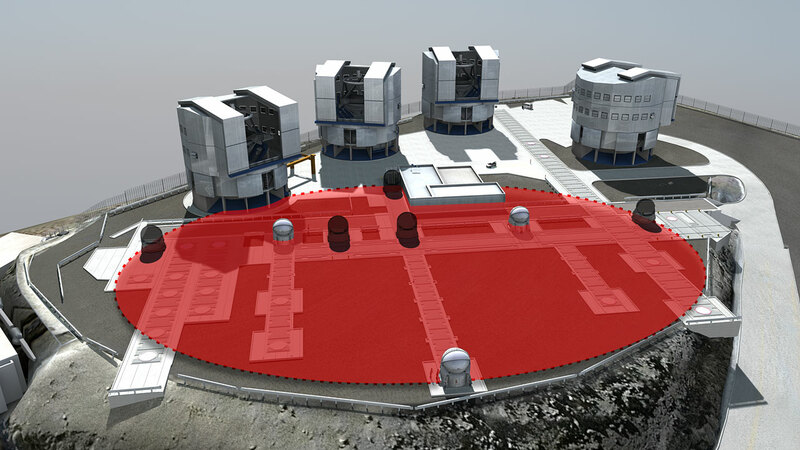 This is what has now been done with ESO’s VLTI, using the 1.8-metre Auxiliary Telescopes. 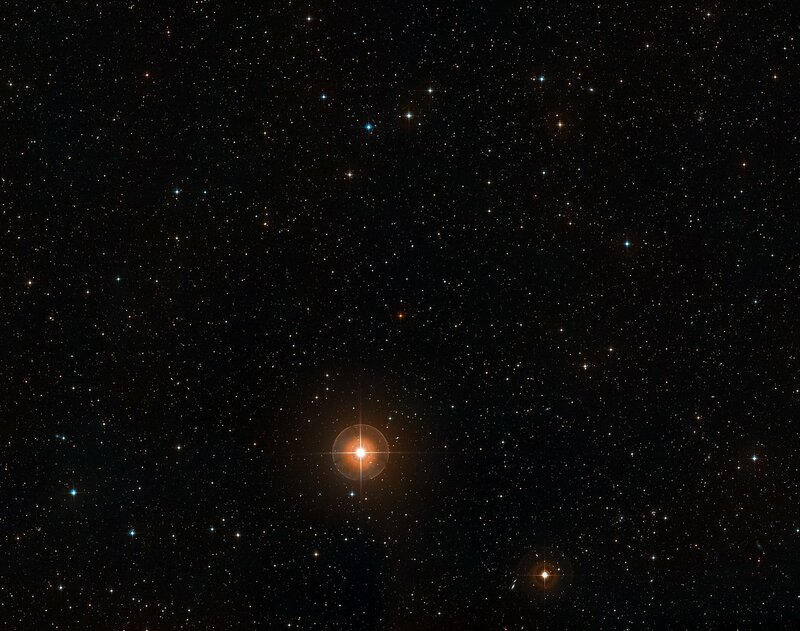 Although it is only 15 by 15 pixel across, the reconstructed image shows an extreme close-up of a star 100 times larger than the Sun, a diameter corresponding roughly to the distance between the Earth and the Sun. This star is, in turn, surrounded by a sphere of molecular gas, which is about three times as large again. T Leporis, in the constellation of Lepus (the Hare), is located 500 light-years away. It belongs to the family of Mira stars, well known to amateur astronomers. These are giant variable stars that have almost extinguished their nuclear fuel and are losing mass. They are nearing the end of their lives as stars, and will soon die, becoming white dwarfs. The Sun will become a Mira star in a few billion years, engulfing the Earth in the dust and gas expelled in its final throes. Mira stars are among the biggest factories of molecules and dust in the Universe, and T Leporis is no exception. It pulsates with a period of 380 days and loses the equivalent of the Earth’s mass every year. Since the molecules and dust are formed in the layers of atmosphere surrounding the central star, astronomers would like to be able to see these layers. But this is no easy task, given that the stars themselves are so far away — despite their huge intrinsic size, their apparent radius on the sky can be just half a millionth that of the Sun. “T Leporis looks so small from the Earth that only an interferometric facility, such as the VLTI at Paranal, can take an image of it. VLTI can resolve stars 15 times smaller than those resolved by the Hubble Space Telescope,” says Le Bouquin. To create this image with the VLTI astronomers had to observe the star for several consecutive nights, using all the four movable 1.8-metre VLT Auxiliary Telescopes (ATs). The ATs were combined in different groups of three, and were also moved to different positions, creating more new interferometric configurations, so that astronomers could emulate a virtual telescope approximately 100 metres across and build up an image. “Obtaining images like these was one of the main motivations for building the Very Large Telescope Interferometer. We have now truly entered the era of stellar imaging,” says Mérand. 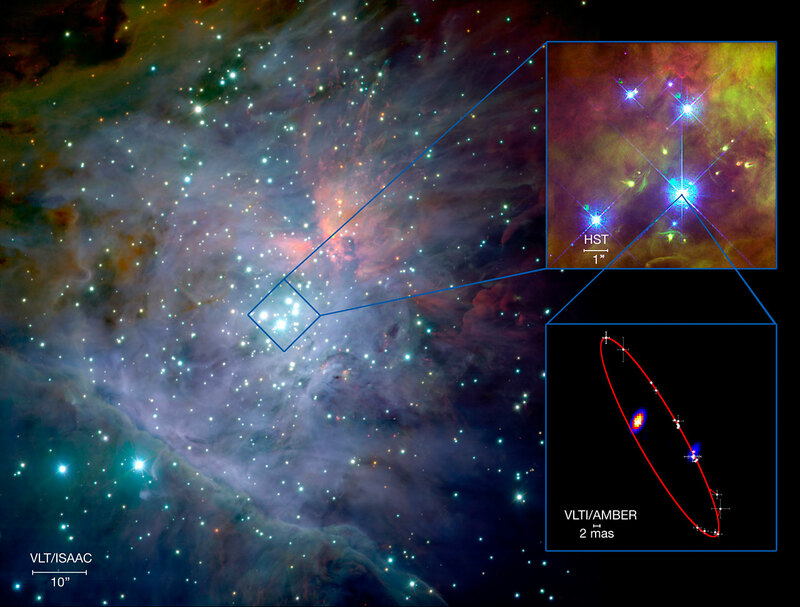 A perfect illustration of this is another VLTI image showing the double star system Theta1 Orionis C in the Orion Nebula Trapezium. This image, which was the first ever constructed from VLTI data, separates clearly the two young, massive stars from this system. The observations themselves have a spatial resolution of about 2 milli-arcseconds. 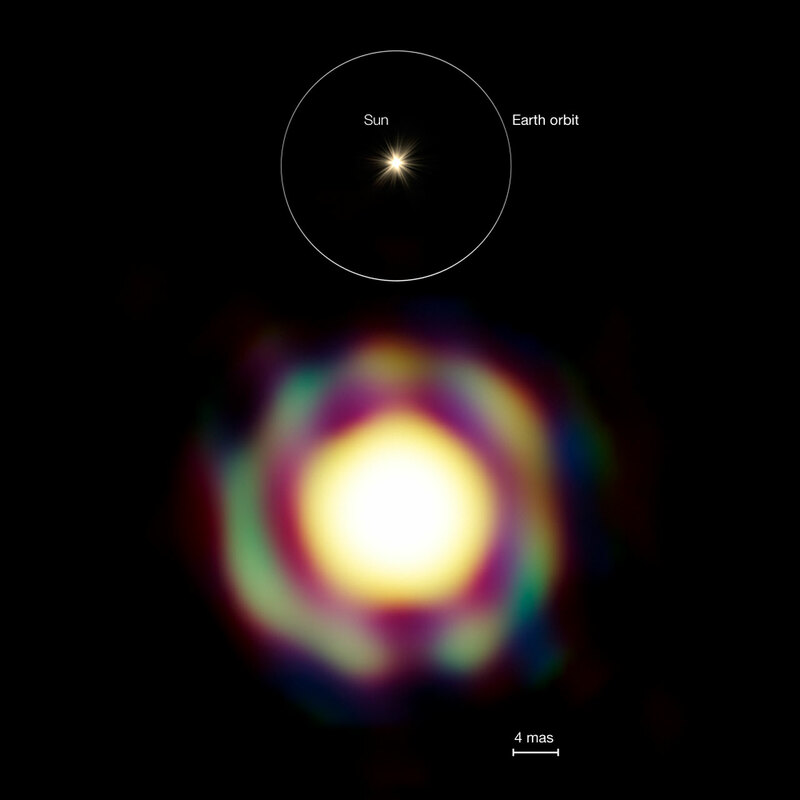 From these, and several other observations, the team of astronomers, led by Stefan Kraus and Gerd Weigelt from the Max-Planck Institute in Bonn, could derive the properties of the orbit of this binary system, including the total mass of the two stars (47 solar masses) and their distance from us (1350 light-years). The VLTI will however not be able to observe the Moon as its surface is too big to produce the interference patterns necessary for this technique. These results are to appear in a Letter to the Editor in Astronomy and Astrophysics (J.-B. 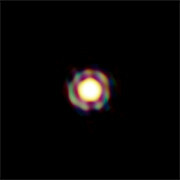 Le Bouquin et al., Pre-maximum spectro-imaging of the Mira star T Lep with AMBER/VLTI). The team is composed of Jean-Baptiste Le Bouquin and Antoine Mérand (ESO), Sylvestre Lacour and Stéphanie Renard (LAOG, CNRS, Grenoble, France), and Eric Thiébaut (AIRI, Observatoire de Lyon, France). The Theta1 Orionis C result is presented in an article to appear in Astronomy and Astrophysics (S. Kraus et al., Tracing the young massive high-eccentricity binary system Theta1 Orionis C through periastron passage).